iCollector.com is presenting online viewing of the July 13th, 2016 auction from RR Auction. This auction catalog an incredible selection of over 1100 lots to browse and bid. 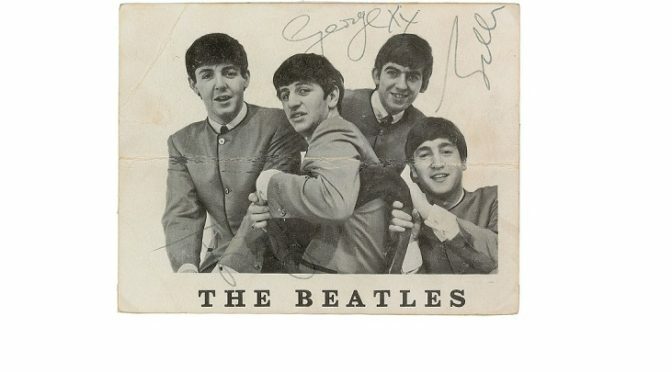 There are autographs from important political and influential people, letters and documents, and historical pieces and artifacts. This selection comes from the personal collection of Everett Fisher. 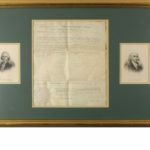 RR Auctions is a globally recognized and trusted source for rare documents, manuscripts, autographs, and historic artifacts. 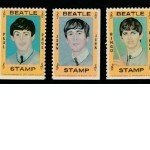 They have achieved countless record setting prices in over 400 successful sales and have an international reputation through both media and private collectors. One of the feature parts of the auction is a collection of Comic Art and Animation pieces throughout the sale. Lot 554 highlights several pieces from Walt Disney with a beautiful vintage photo of Mr. Disney. This has a wonderful vintage matte-finish of an 8 x 10 head-and-shoulders photo of Disney, prominently and attractively signed in fountain pen. The photo is in fine condition, with diagonal creases to the upper right corner. With its huge signature and clear image, this is a quintessential uninscribed photo of the man behind the mouse. Accompanied by a full letter of authenticity from PSA/DNA. This is estimated in value from $4000 to $5000. A must bid item for serious collectors of Disney memorabilia is on display at Lot 613. This is an incredible original production cel from Snow White and the Seven Dwarfs, depicting the reflection of the Evil Queen just moments before she transforms herself into a horrible witch. The cel has been trimmed and applied to a hand-painted background as prepared by Courvoisier Galleries for sale. Image measures 5 ¼” in diameter, with a mat opening of 7 ¼” x 7 ¼”. 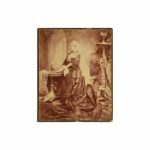 This piece is regally triple-matted and framed with an engraved plaque to an overall size of 23 ¾” x 24”, and is in fine condition. Obsessed with reclaiming her position as ‘the fairest one of all,’ the Evil Queen drinks a powerful elixir and transforms herself into an old hag, a disguise intended to trick Snow White into tasting a poisoned apple. This remarkable cel portrays the Evil Queen in all her haunting and vainglorious beauty during one of the most dramatic scenes in animation history. Given that the Queen is present in only a handful of scenes, this cel remains exceedingly scarce, and is thus highly sought-after by collectors. Estimated value is from $8000 to $12000. 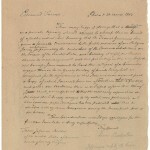 A magnificent letter from Benjamin Franklin is the highlight of the auction at Lot 154. This is a magnificent Revolutionary War–dated ALS signed “B. Franklin,” one page, 7 x 9, March 13, 1779. Letter to “the Representative of the Author of Experiments on the igneous Fluid,” Jean-Paul Marat. In full: “I think my self much honour’d by the Invitation, and shall endeavour to be present at the farther Exhibition of those ingenious Experiments, when I am informed of the Day and Hour appointed by the Committee.” Handsomely mounted, matted, and framed with a portrait. In fine condition. Both this letter and Marat’s invitation are published in The Papers of Benjamin Franklin. An incredible piece of history and is going to drop to the auctioneer’s hammer between $35000 and $45000. All documents are available in the online catalog with full descriptions and images. RR Auctions is pleased to offer services to answer any questions and bids are accepted by contacting them directly to register. The catalog is showing on iCollector.com right up until auction day on Wednesday July 13th, 2016.